Like Knights of old, Let's fight to hold, The glory of the Purple Gold. Let's carry through, Let's die or do, To win the game for dear old LSU. Your kid has been a fan of football since…well ever since he popped out. Your brother bought him a little football plush instead of a stuffed animal the day he was born. And ever since it has been football this, football that. Not that you mind, he really likes it and you can’t blame him. It’s an exciting game. But his favorite team isn’t even an NFL team. Sure he likes them, he roots for the Ravens, or anyone opposing the Steelers if the Ravens aren’t playing. But he really loves college football. Like goes crazy every time the Rose Bowl happens—way more so than the Super Bowl. But the LSU Tigers are his team. He basically bleeds Purple and Gold. From Franklin Sports, this Tigers costume uniform set is NCAA officially licensed. It comes with all the gear any boy or girl will need to look just like a college football player. It includes a jersey, pants, helmet, chin strap, and an iron-on number kit! This costume set is for play and costume fun only, as the helmet does not offer any protection. But have them choose their favorite number, and they'll look just like an official player of the LSU Tigers! 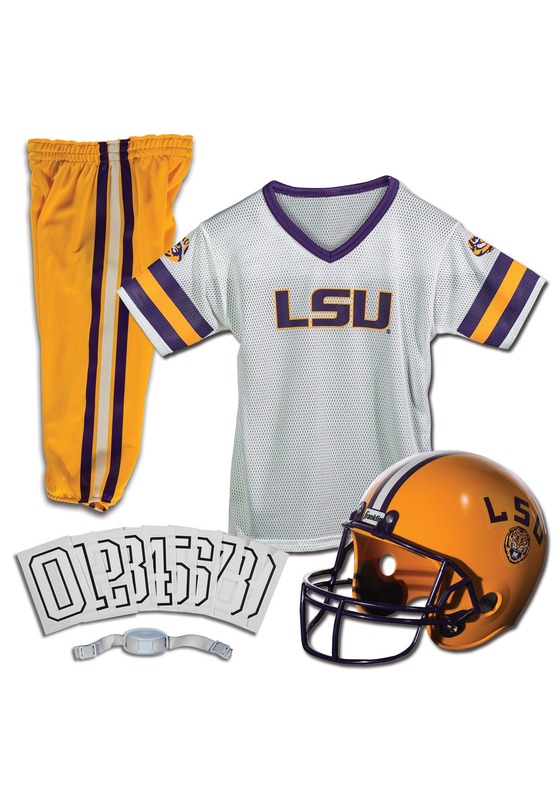 This year surprise him with this LSU Tigers Child Uniform. He will be so excited that he can dress up like his favorite team. He can even choose the numbers to iron on his uniform. He will insist that your brother take him out to scrimmage on the lawn before LSU takes the field. Heck, he might even go on to play for the Tigers when he goes off to college, and if that happens you will have all the photos of him as a kid dressed like his favorite team. Now wouldn't that be sweet!